Save $4.95 off the price of the Telescopic Handle when you purchase it in a brush combo! You’ll be an instant fan of the Montana Original Boar’s Hair Wash Brush PLUS. The base of the brush is bent to cause the bristles to fan out. The design gives the brush additional surface area and therefore more space to hold soapy water. The fan of soft bristles is fast and efficient on large vehicles, especially with the Telescopic Handle!. The Montana Original Boar’s Hair Wash Brush PLUS has all the excellent features of our original brush plus a unique fan shape. The shape is beneficial in two ways: First, when the handle is in place, it is at a 90 degree angle to the bristles. This means you can hold the brush at a more comfortable angle when washing the roof of a tall vehicle. Secondly, a broader surface of bristles reduces the chance of the base of the brush coming into contact with your vehicle. All in all, it’s a safer way to wash. The Montana Original Boar’s Hair Brush PLUS features four hundred hairs per bundle. Boar’s hair is naturally feathered at the ends but our bristles are flagged (split) one more time before being affixed to the heavy duty plastic handle. The tight bundles of hair ensure that the bristles remain sturdy as they gently whisk away dirt and grime from your vehicle. Boar’s hair is surprisingly soft and its durability is unmatched by any other natural hair. It’s been used to make hair brushes for people for years. Unlike synthetic bristles that can rub your vehicle the wrong way, boar’s hair stays soft. It lightly massages the surface of the paint and, amazingly, it doesn’t fall limp when wet. No nylon or polyester fibers are used in this brush – its 100% boar’s hair! Each of the dense bundles of hair is permanently secured to a 10” molded plastic block. The block is curved to increase the contact area between the bristles and your vehicle. Washing large vehicles has never been easier! Boar’s hair naturally holds more soapy water than synthetic materials and the bristles do not retain dirt like sponges or mitts can. Use the Montana Original Boar’s Hair Brush PLUS & Telescopic Handle to gently wash large vehicles – like vans, big trucks, and SUVs – as well as boats and RVs. The soft, natural bristles will not scratch clear coats, gel coats, fiberglass, plastic, or any other surface. The Telescopic Handle makes a valuable addition to the brush. The durable aluminum handle can be adjusted from 26 inches to 45 inches. Reach the roof of your SUV or wash lower panels without kneeling. The Montana Original Boar’s Hair Brush PLUS is 10 inches wide. It fits perfectly in the Autogeek Complete Wash System bucket or any standard 5 gallon bucket. Give your vehicle a luxurious wash with the Montana Original Boar’s Hair Wash Brush PLUS & Telescopic Handle. Its fanned shape gives it excellent access and maneuverability as it glides over your vehicle’s delicate surfaces. The Montana Original Boar’s Hair Brush PLUS is 10 inches wide. 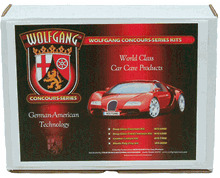 It fits perfectly in the Wolfgang Complete Wash System bucket or any standard 5 gallon bucket. Detailing Tip: Soak your boar's hair wash brush in soapy water for a few minutes before use to make the hairs even softer and more pliable! The Montana Original Boar’s Hair Wash Brush PLUS is threaded to fit the Telescopic Handle listed below. Purchase them together for just $10 more than the cost of the brush itself!